Jim had his second stroke at the age of 61. It was devastating, but Jim was strong, was surrounded by family, and had a great sense of humor. 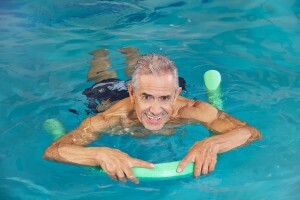 Jim was determined to “dive into the deep end” if that was what it would take to get his life back! Jim’s wife approached Hired Hands in the Spring of 2015. We would provide a broad range of services to assist Jim in his rehabilitation and recuperation. Not only did we provide home care services at his home in Santa Rosa, but also at the Santa Rosa Junior College, where he attended conditioning and swimming classes, and speech therapy. Quite a daily challenge, but Jim was determined… and making great progress! Today, we received the following note. After an amazing amount of hard work, Jim has overcome his obstacles, and regained his independence. It has been an absolute honor being of assistance to Jim and his family, and we fully salute his hard work towards recovery. “Jaime, This e-mail is to confirm our conversation just now in which I told you that we will no longer need the services of Hired Hands effective today. We spoke to Jim’s instructors and the SRJC and they feel confident that Jim can take the classes by himself. He has been given the ok to drive himself to the SRJC classes and has successfully and confidently done that several times in the last several weeks. Therefore we will no longer need the assistance of Hired Hands. Jim has been improving consistently and I can only believe that it will continue.